A few weeks ago I was performing a security test on a mobile banking application. The application was using a framework that provided additional obfuscation and encryption on top of the TLS connection it used to communicate with the remote server. I used Frida to intercept and dump the plaintext requests/responses before the encryption took place. I wanted to modify intercepted API calls and see how the remote server responded, but this required me to modify the Frida script each time. Burp is really my tool of choice for (web) backend testing, and a mobile backend should not be that much different. I wanted to make Burp work together with Frida, and intercept/modify API calls in Burp. I did not go as far as creating a Burp plugin, but using a small script we can already get started with intercepting API calls. This spared me the trouble of modifying the frida-trace handler script each time I wanted to modify an API parameter. Burp will receive the API request sent by Frida. The user can then modify the call in transit in Burp, which then forwards the data to the echo server. The echo server will simply reflect the (modified) request in the response, which is received back by the Frida code. 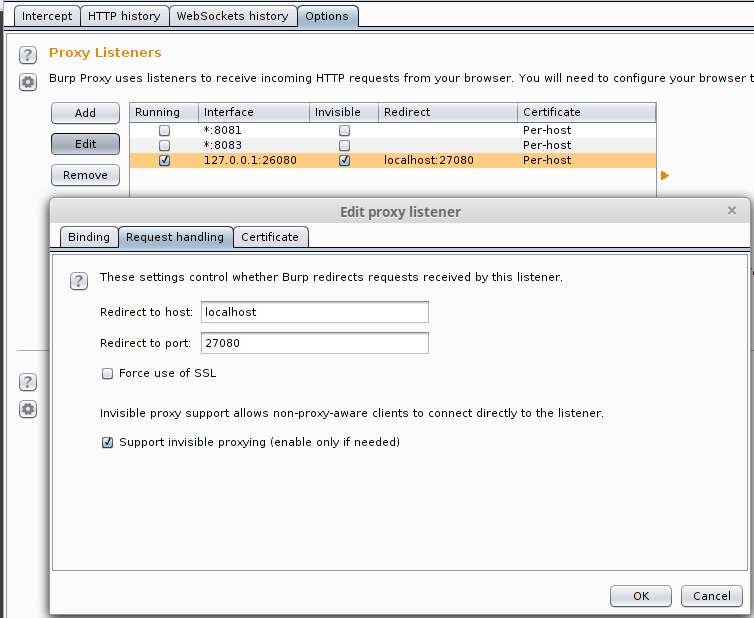 Setting up a Burp listener redirecting to the echo server. I opted to extend (or rather monkey patch) the existing frida-trace code, in order to have the same flexibility of the tracing tool. The following Python code extends the frida-trace code to work together with a server you forward the API call to. It does this by sending an HTTP request to the local Burp listener we created. You could also add metadata in the HTTP headers about the API call, or specify a URL path to distinguish between different API calls, which will be visible in Burp. The current code might be version dependent: I don’t know what will change in future versions, though it currently works with Frida 8.2.2. 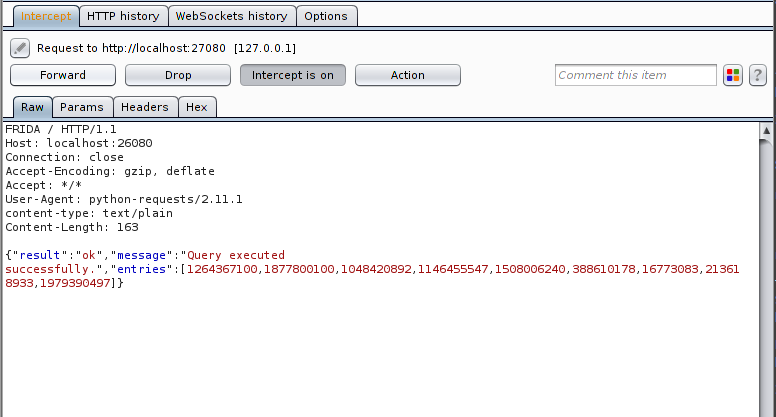 The following example could be used to intercept read() calls in the onLeave function. This should be easily adaptable for your own usecase. We only need to forward/intercept the arguments that we want to tamper with. I’ve implemented this by using the Frida send() API. This call is received by the Python code, which then responds back to the handler script. The script waits synchronously for a response (while we are performing modifications in Burp), and then executes the callback function. The following script is a small implementation of an echo server that responds to “FRIDA” requests and echoes back the request payload. This could be extended as well with your own logic to modify requests on-the-fly (although you could just as well implement that directly in your Frida scripts).